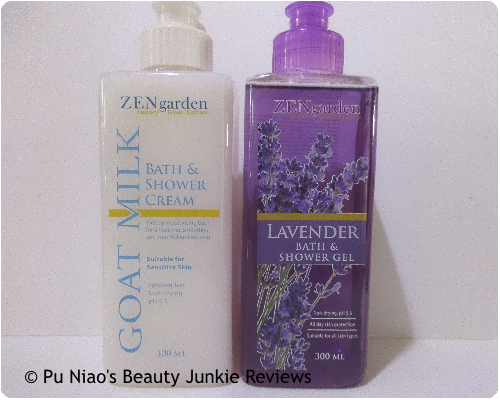 Goat Milk retails at S$1.00 per 300ml bottle while Lavender retails at S$2.00 per bottle, if you were to buy the bundle pack of 1 litre and the 300ml bottle together, you only need to pay S$3.00 altogether. Because I haven't tried this brand before, I didn't dare to buy the bundle pack in case my skin has an allergic reaction to it. Well, I've tested a small amount of the Pure Clarifying Foam Wash right inside the retail shop itself, and I dare say, the skin on my left hand looks brighter when compard to the right hand. The shower gel is because I don't use soap bars at all due to sensitive skin. 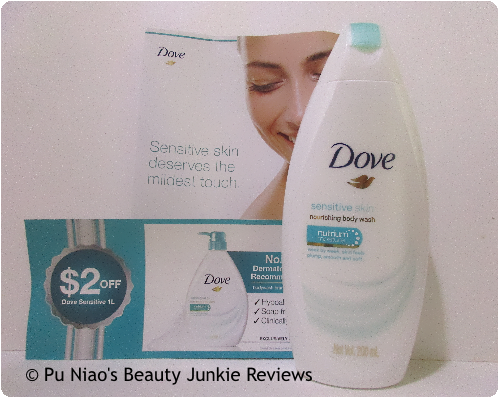 WHERE TO REDEEM SAMPLE: I don't recall seeing sample sachets for shower gels, but for the foam wash, you can try asking. As I've tried it inside the retail shop, I'm guessing there's no sample sachet for the foam wash as well. Well, a visit to The Sample Store's "Free Samples" page reminded me of how long I've been deprived of writing anything on this blog. NEVER AGAIN!!! 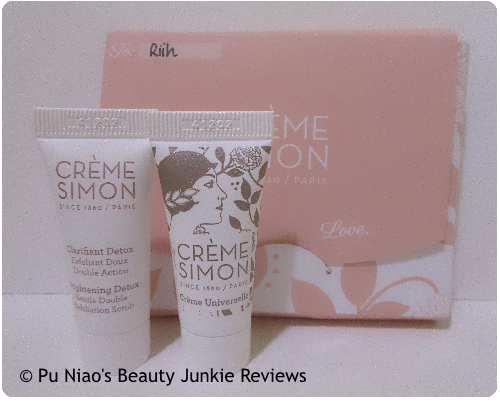 Happened to know about 2 samples available for redemption at Crème Simon's website, but you need to register an account on their website first. Just a warning, while attempting to check out my samples, the website kept giving me weird error messages and I though it didn't went through. Tried to re-request again and the website stated that I've already requested for the samples. If you encountered the same thing as I've mentioned, try re-requesting once again and it should inform you that you've already requested for the sample. Delivery took less than a week, so no harm in waiting. 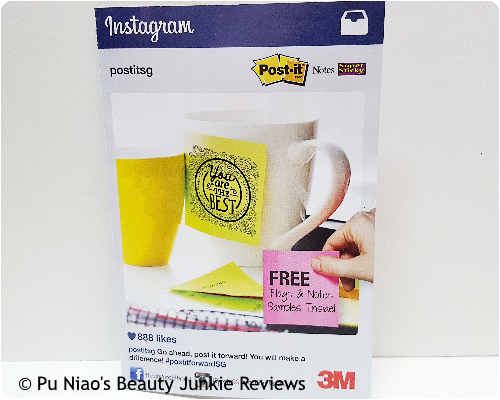 WHERE TO REDEEM SAMPLE: Go over to creme-simon.com/collections/, scroll down until you see the above 2 products, there will be a "REQUEST FOR SAMPLE" button that is clickable. The samples will be mailed to your mailbox. Anyway, I got my samples as Cetaphil was organizing some sort of online FB contest. 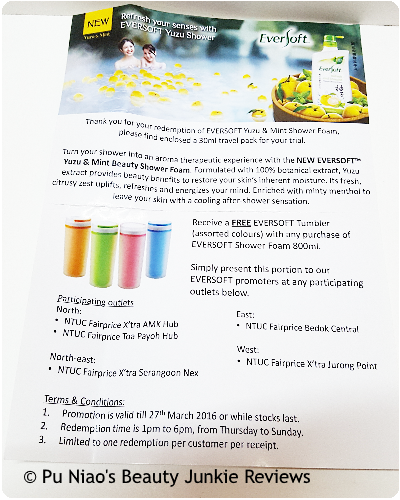 But you can just skip the contest and get the samples instead, if you don't wish to join. 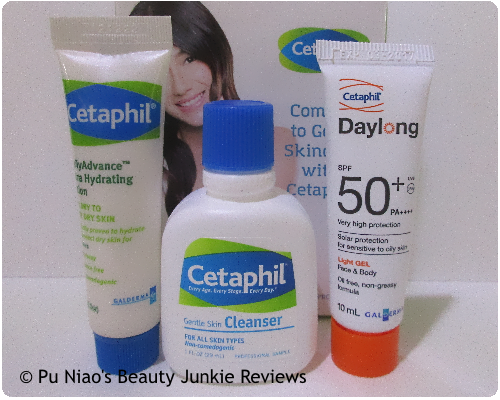 WHERE TO REDEEM SAMPLE: Go over to cetaphil.com.sg/samples/ and fill in your details. The samples will be mailed to your mailbox. 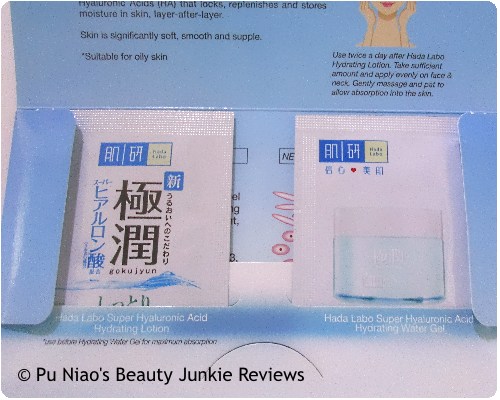 WHERE TO REDEEM SAMPLE: Go over to hadalabo.com.sg/, on the right of the website, you'll see "Free Samples" flag. Doesn't matter which sample you picked, you'll get one of each when they mailed it out to you. 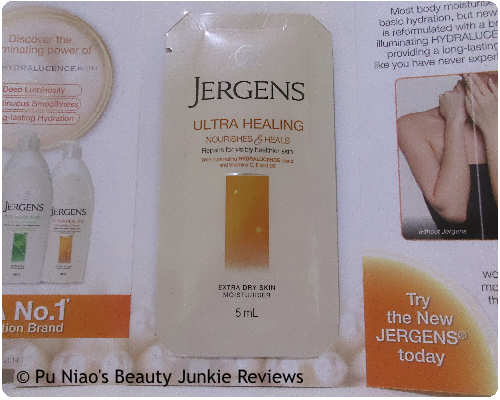 WHERE TO REDEEM SAMPLE: Go over to ksgpromo.com/jergens/, fill in your details and the sample will be delivered to your mailbox. Q: So tell us, what's the notes for this particular Eau De Toilette? Q: What does this Eau De Toilette reminds you of? Q: How long does the Eau De Toilette lasts after spraying? A: The scent is strong at first, smoky and heavy with a rose scent at the beginning, but then slowly dries down to a cozy sweet musk of cream and honey that lasts quite long ❤❤❤ Omigosh!! Sweet cream and honey!! Q: Is this Eau De Toilette good for the climate in Singapore? A: As woodland creatures, we know the 4 seasons very well. We even know where to gather berries and nuts when winter is nearing. During winter, this scent seems to be only just a pleasant light sweet musk, nothing too heavy-headed. But now that it's getting really warm recently, we can smell every single note! And this is the first time we noticed how soft, sweet and creamy it smells. ❤❤ Definitely a must-have for months when the weather is slightly warmer. Q: How would you rate this Eau De Toilette as a whole? Q: How many points would you guys rate this Eau De Toilette, out of say, 100 points? 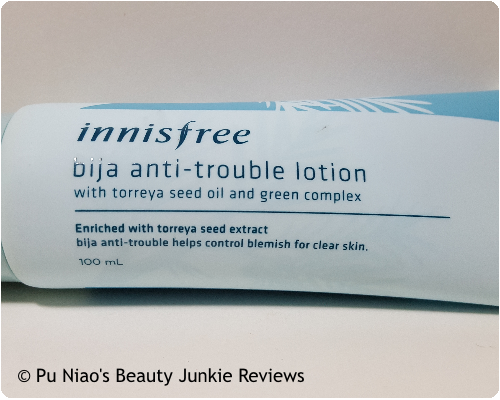 Innisfree Bija Anti-Trouble Lotion: This watery moisturizing lotion helps to clear and treat troubled skin with its outstanding protection power of jeju torreya seed oil and natural originated salicylic acid. A moisture rich antiblemish lotion with natural Jeju torreya seed oil, outstanding healing effects of the torreya seed oil help troubled skin. Contains natural salicylic acid for exfoliation and blemish care, oil-free moisturizer and 100% Natural essential oil: The scent of pine, juniper berries, and the forest comforts your mind and body. 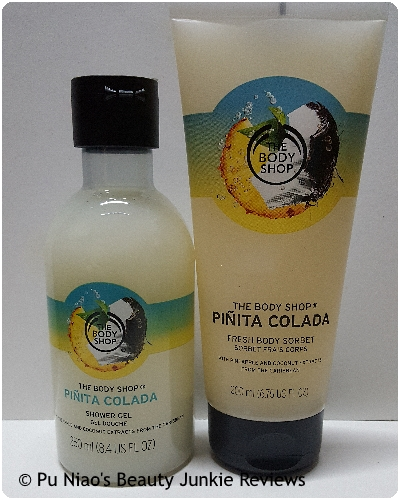 This lotion comes in a white opaque milky liquid consistency while the texture doesn't feel heavy like a cream. The scent is rather splended, somewhat like a forest-y type of scent and the lightweight lotion spreads evenly without making my skin feel heavy and clogged. VERDICT: Despite the product claiming to have the scent of pine, juniper berries, and the forest, I think I pretty much get the "forest" part. 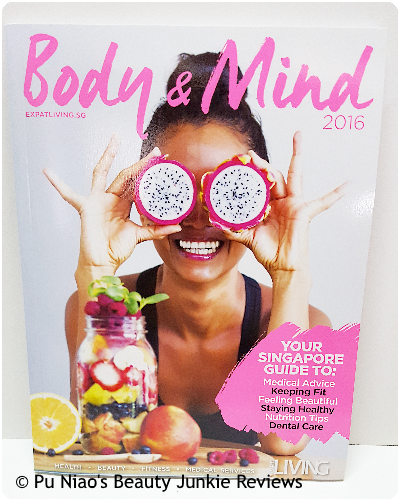 It doesn't help that most Singaporeans wouldn't have known what Pine and Juniper Berries are supposed to feel like, while Pine products seems manaufactured to the point you won't even know if the pine scent is real or manufactured. But anyways, that forest scent I mentioned, it's almost like skipping through a magical forest somewhere where your skin feels relaxed and calm. 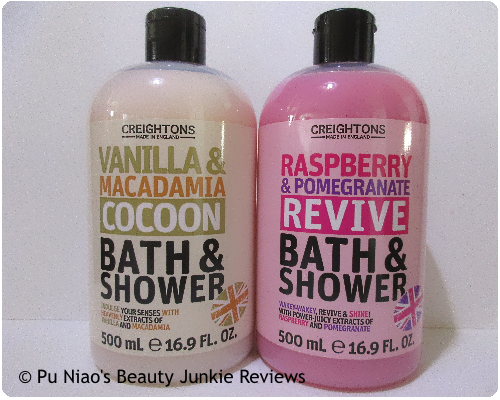 I was actually recommended this range by the SA at Plaza Singapura Innisfree sometime in March/April a year ago. 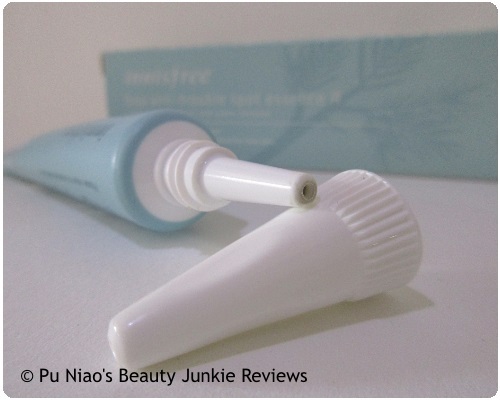 Reason for going to Innisfree to find a good daycare skin regime product is really due to the reason that their Innisfree products seems just about enough and straight forward. 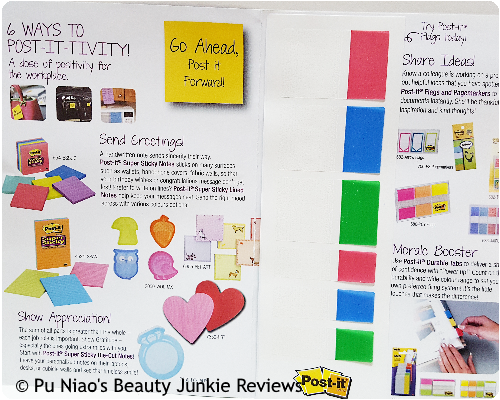 Instead of the usual skin/body-based product shops that seems to sell a bazillion products that makes you feel as if every item is a must-have. Over at Innisfree, the ranges seemed few but well detailed and the SA actually seemed to know their products pretty well too. 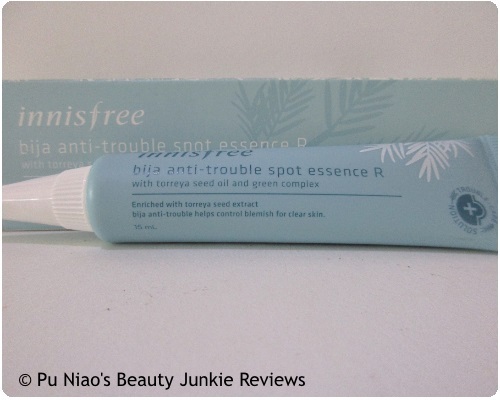 No matter how I tried to explain my skin problems by tweaking it, I kept being recommended back to this Innisfree Bija Anti-Trouble range without fail. It's like, their SA doesn't get sidetracked easily and is dedicated to ensureing you make the right purchases for your skin type. 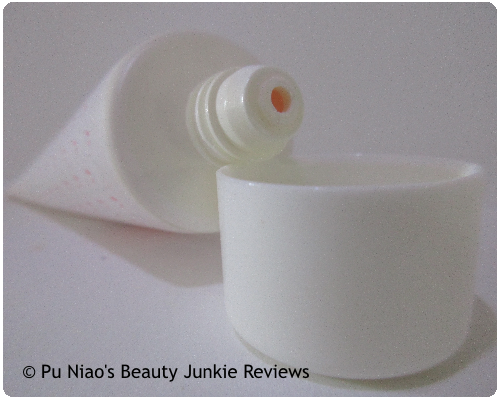 The lotion itself is a white color milky liquid, that at first glance looks heavy like a cream-based moisturizer. But as soon as you rub it into your skin, the lotion simply melts into your skin with gently massaging. 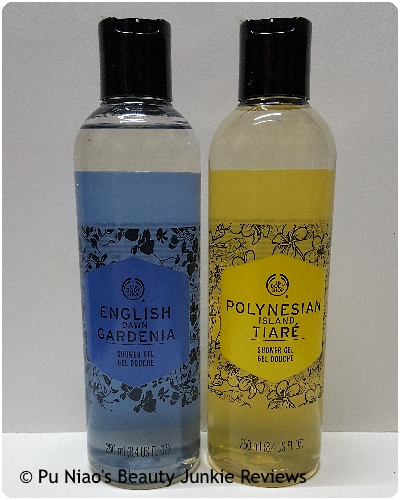 And naturally, no parabens were located anywhere on the tube itself, instead, I got Jeju torreya seed oil and salicylic acid with extracts such as from Japanese Camellia, Camellia Sinensis, Opuntia, Satsuma and white willow. During and after application, my skin doesn't feel sticky, heavy, nor clogged at all although it has a slight cooling sensation that makes your skin feel relaxed at the cooling sensation. 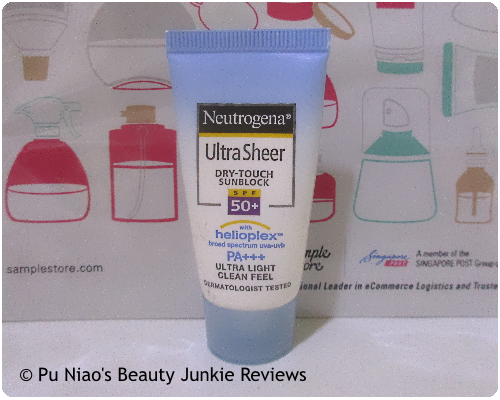 After using it for around 2-3 weeks, I noticed that my skin started behaving better. 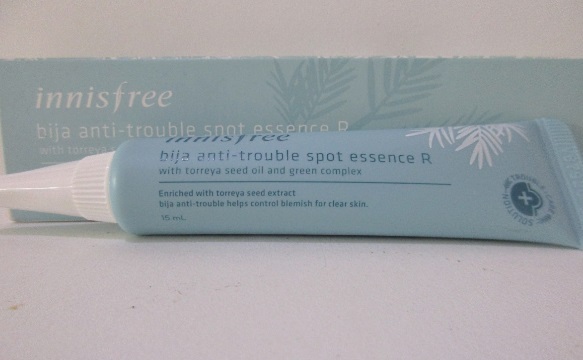 Meaning: pimple outbreaks were less as compared to before using this product. Existing pimples weren't irritated at all and didn't even "sit" clueless on my face for days and weeks on end, instead, my existing pimples actually cleared up normally. My skin doesn't even look that oily during the day, and neither did it feel heavy from having a product applied on it. Normally, my skin feels like it's been through a week of existence even though it's only a mere 24 hours. You'd understand the feeling on your face when you didn't apply or apply the wrong facial moisturizer. And I actually use the toner and this lotion as my daytime skincare regime, short and simple with 2 products during the day as I'm not too fond of loading extra products on my face during daytime as I sweat rather easily from the humidity. Basically, this helps to treat skin with acne and pimple issues, not an overall product that gets rid of acnes and pimples and blemishes. But I find that this product works just well for my skin without bad aftereffects. 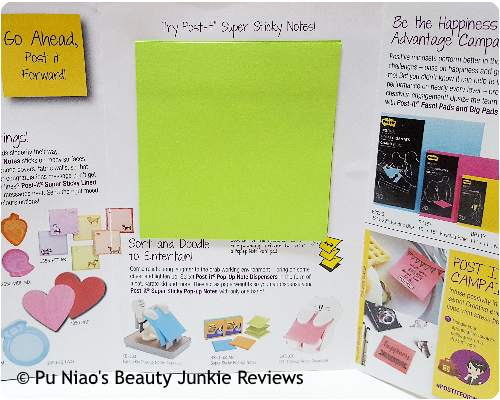 WHAT I THINK: Honestly, I didn't expect much from this product as I've been using so many different types I'm almost jaded in trying anymore sometimes. But this product range surprises me quite well with it's simple promises. 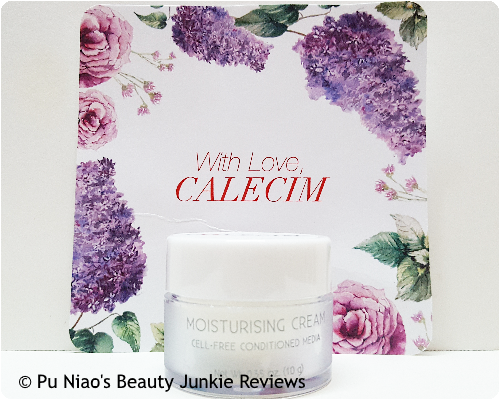 My skin feels calmer and refreshed without feeling heavy nor clogged at all. And it's really lightweight and absorbs easily into my skin without hassle. WHERE TO REDEEM SAMPLE: I haven't encountered any sample products for this range, but you can try asking in any Innisfree if they have samples for trying first. One of the top most common complaint we all have about our teeth is that they're discolored from so many things. 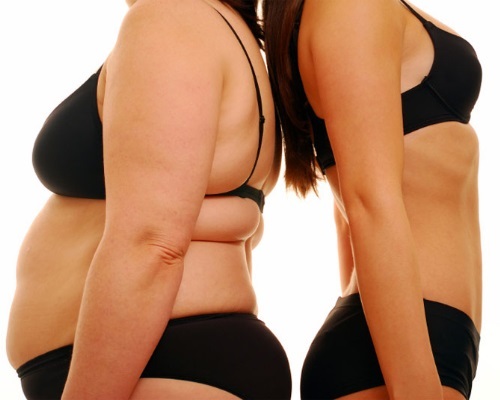 Such as drinking coffee, tea, smoking, eating highly pigmented foods, to quote a few as an example. This always result in an ugly yellowish tinge on our teeth that everyone of us loathes to see when we look into the mirror. If we do have extra money to burn spend, we can always visit a dentist for a quick whitening treatment. But let's face it, no matter the economy, we either don't have the extra money or even want to spend that extra money on teeth whitening. Unless we're earning S$10,000 a month from our jobs, that would have been a different story though. And this is one of the few reasons people start getting creative and looking in their own pantry for household products that does the job, but for a mere fraction of the price. 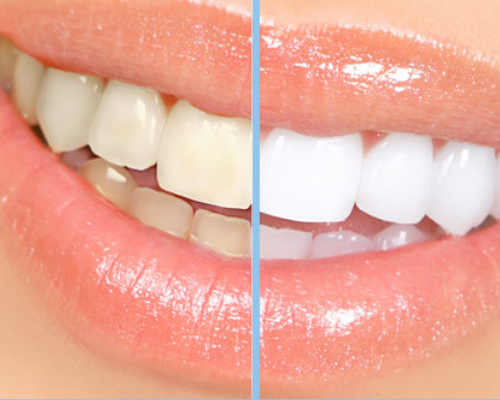 DIY teeth whitening is one of those beauty treatments that sounds like it involves science and seemed rather hard to do, but honestly, it really isn't all that difficult to grasp and do note, no matter what your budget is, it will never ever burn a hole in your pocket and wallet for that. But be aware that if you are a regular caffeine drinker (coffee, black tea) or a regular smoker for years already, this DIY teeth whitening method might not be enough to restore the former whitening glory of your teeth. Maybe only just a little, in fact, these DIY tips are better suited for you if you just want your teeth to be a few shades whiter as it does not totally eliminate and get rid of severe stains. Basically, you only need 2 products: Hydrogen Peroxide and Baking Soda. Yes, Hydrogen Peroxide is mainly used for cleaning cuts and scrapes, but surprisingly it works. Unsure still? Next time when you are out shopping in the supermarket, look at the ingredients in teeth whiteners and quality toothpastes as most times, hydrogen peroxide and/or baking soda is included in the ingredients list as well. Swap out your normal mouth rinse with hydrogen peroxide or mix it with a ratio of half cup mouth rinse and half cup hydrogen peroxide. Swish liquid (not gargle) around your mouth for at least a full minute before you spit it out. You can rinse your mouth again with plain tap water to get rid of the weird taste too. Just don't forgo the plain water mouth rinse please. Make a mixture using a tiny amount of toothpaste (roughly the amount you need to brush your teeth with) in a small container, add in 1 teaspoon of baking soda and half a teaspoon of plain tap water. Once the mixture is thoroughly mixed and resembles the consistency of toothpaste, use it to brush your teeth for a full 2 minutes gently like how you would brush your teeth on a regular basis. Spit out and rinse your mouth thoroughly with plain tap water. Check your reflection in the mirror, does your teeth looks as if you've treated it with those expensive teeth whitener and expensive toothpaste products? But please be aware that this is only recommended for a once weekly usage until you get the desired shade of white you want for your teeth while at the same time cutting down on teeth-staining food and drinks. 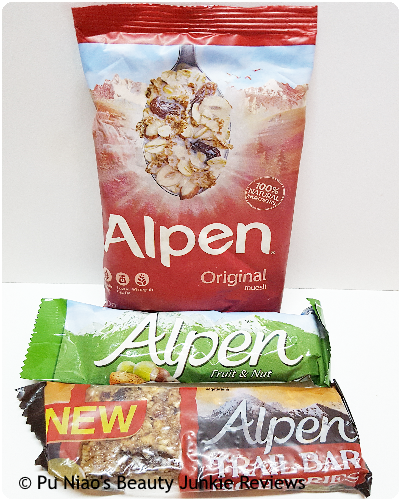 If you must have these, at least do rinse your teeth with plain tap water and brush gently without toothpaste after consuming teeth-staining food and drinks to prevent your teeth from getting stained again. Once your teeth is in the shade of white you desired, limit the baking soda treatment to only once a month to maintain the whiteness. Because if you use the baking soda treatment on a regular basis, it will gradually wear down the enamel on our teeth and make your teeth more susceptible to cavities. Basically, while you have a megawatt white smile, you'll at the same time suffer from sensitive teeth and cavities, which is worse than having teeth discoloration in the first place. Without overdoing this simple DIY, you can have a beautiful smile full of clean white teeth while saving hundreds of dollars to the dentist for professional teeth whitening. Because if you realized, I doubt dentists will ask you to go back for a weekly teeth whitening session. First time round, they'll whiten your teeth as much as they possibly can without trying to do much damage to the enamel in your teeth. The rest is up to you on whether you want to take care of it or not. If you don't, you're just giving the dentist extra money on a monthly basis for teeth whitening. 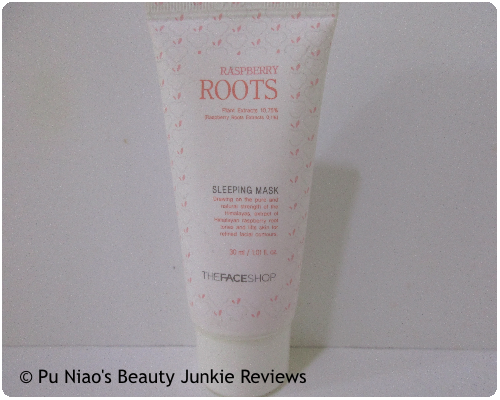 The Face Shop Raspberry Roots Sleeping Mask: Drawing on the pure and natural strength of the Himalayas, extract of Himalayan raspberry root tones and lifts skin for refined facial contours. Skin problems? Try sleeping on it with this overnight beauty mask and wake up to porcelain smooth skin. Himalayan Raspberry Roots and Grain Extracts optimize elasticity and tighten pores while thoroughly hydrating and replenishing skin of lost nutrients. Additions of plant extracts in the formulation promote the natural secretion of pleasure-inducing beta endorphins and stimulate the formation of collagen for more youthful skin. 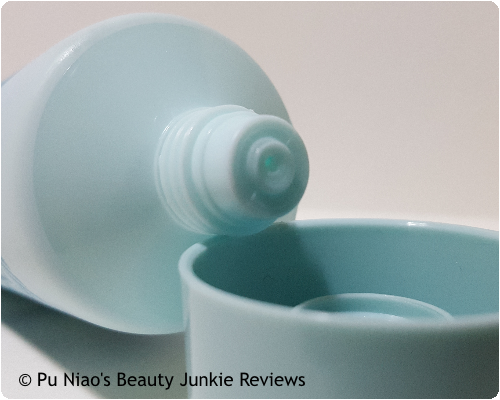 It comes in a cloudy gel form that spreads like water easily without much hassle, although it leaves a layer of shine and sheen on my face after application. 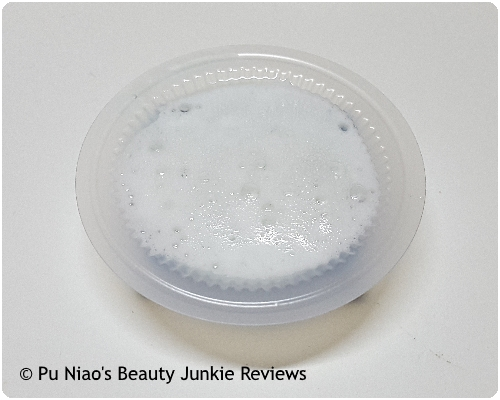 VERDICT: I got this trial/sample version while on my previous a.k.a last The Face Shop haul for hair products, I really had no intention of getting a sleeping mask from Korean beauty shops as I believe most of them are somewhat overhyped. 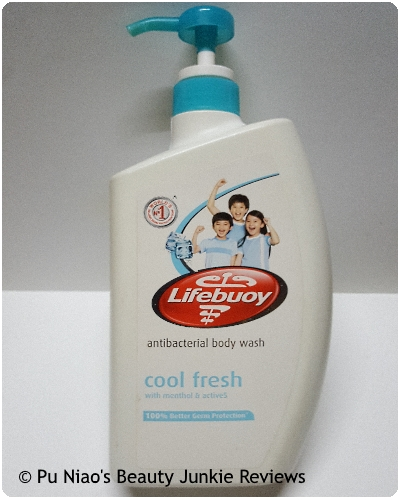 But for their shampoos, it's a different story as it's under-hyped but reliable, trustworthy and useful. Anyway, despite the sales staff in getting me to buy a sleeping mask, which I politely reject, they gave me this trial/sample tube instead so I can try out while reassuring me that it's a really good product that gets rave reviews and is really popular among their clientele. This sleeping mask has a wonderful fruity smell that is clean and fresh, kind of reminds you of walking through a field with nothing but beautiful sweet smelling fruits as far as the naked eye can see. Just don't ask what fruit though as my sense of smell can be quite bad sometimes, so it's a little hard to differentiate scents sometimes, but this fruity smell isn't overpowering nor cloying at all. And the scent actually dissipates upon spreading it on your skin, which I think is rather great. It's better than trying to struggle with a sleeping mask that smells weird and puts you off in using it, huh? Unfortunately, I think it's a over-hyped product that doesn't quite deliver as compared to "how popular it is with our clientele", which I quote the SA saying to me. Maybe it's my skin problem, maybe it's not me but them, I don't know. But I can assure you that after dutifully using this for close to a year, I don't really see much improvement in the pore tightening claim it has. Skin elasticity-wise, there might be some improvement, but it isn't that obvious to tell at first glance either. Kinda like a "Meh!?" to me, to be truthfully honest. A quick way to know if you have dry overnight skin upon waking up is to look for bedsheet lines on your face. If you see it, your skin is losing moisture when you sleep at night. But if you don't, that means your skin is doing okay. 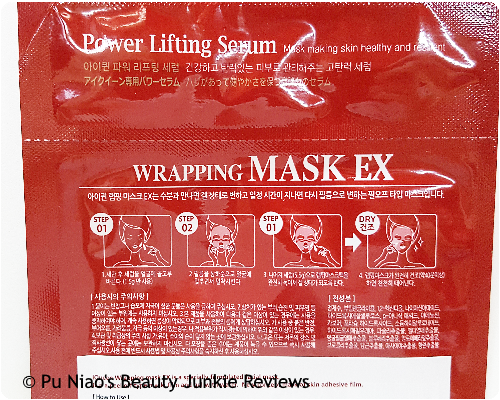 However, I find that after applying this sleeping mask, my face tend to look a little greasy and oily and mind you, I don't put that much products on my face before bed. I literally followed the application instructions to a T as I don't like having my skin feel "heavy" with products just before bedtime. I only apply sparingly, but a quick check on my face seems to suggest that I overload the products instead. But the saving grace is that it doesn't make my skin feel oily upon application as it's a gel-like consistency and texture that spreads easily and evenly on my skin, just that it makes my skin looks oily and greasy though. Thankfully, it doesn't make my skin look red nor make it feel itchy after a night of application. And the best part is that it doesn't trigger my sensitive pimples that I might have on certain days too. But the ultimate gross part? 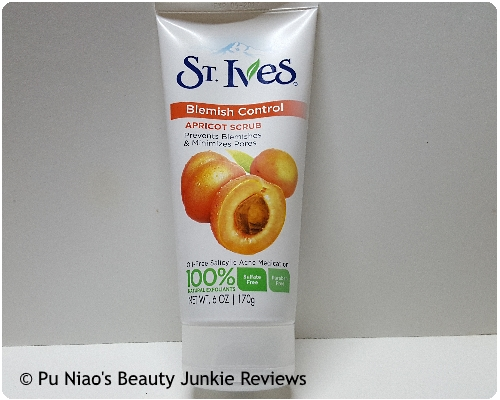 It has parabens in it, so how it got popular among Singaporean females amazes me. 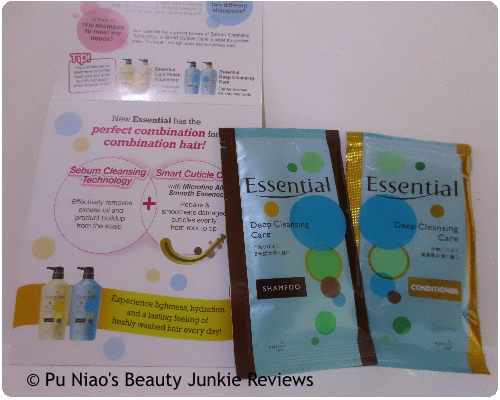 If it's a sample sachet, I don't mind the parabens as it is just one-off. But to have to use a product that contains paraben on a daily basis or even twice weekly is enough to make our skin go astray in the long run. WHAT I THINK: It's actually a good product for me as it doesn't irritate my skin or even irritate existing pimples on my skin, but it's the presence of 5 different types of parabens that make it a turn-off for me. If it's just 1 type and it's a product that is recommended to be used once a week, I still find it acceptable. 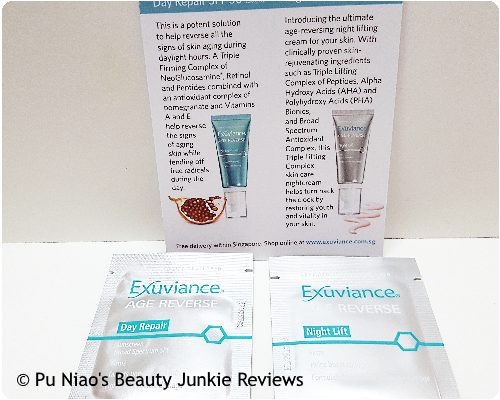 But because my skin tends to suffer from dehydration overnight, I tend to use it up to 3 or 4 times a week to combat the dryness of my skin at night, which makes it a bad product to use on a long-term basis. 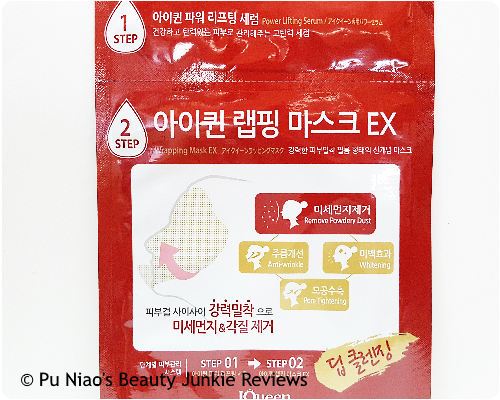 WHERE TO REDEEM SAMPLE: I think The Face Shop should have sample sachets for buyers to take home and try. I got this small tube due to a $100+ purchase. Everyone from our mothers to health experts used to say "Milk is good for your bones", although personally, I don't find myself growing any taller all these years. But according to a study published in the journal Nutrition Research, green tea can help slow down the process of age-related bone loss and at the same time help to decrease the risk of fractures caused mainly by osteoporosis. Especially women who made the effort to drink at least 3 cups of green tea per day have a 30% chance to lower the risk of osteoporosis-related fractures, most noticeably from the hip. If we are to take a look at Japan for example, cancer rates are actually lower there, because green tea is the number 1 go-to drink. While researchers cannot be absolutely sure that just consuming green tea alone is responsible for low cancer rates, we do know that tea contains chemicals EGCG, EGC and EC, which are highly known for their antioxidant activity. These chemicals help protect our cells from DNA damage, which is one of the first steps in growth cancer cells. Also, the properties in green tea can help protect your skin from UV damage which is also a leading cause of skin cancer. 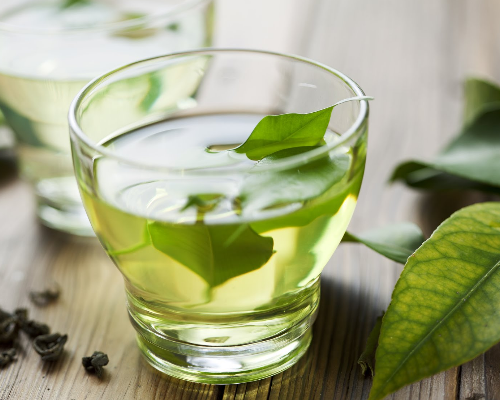 Not only does green tea helps you to maintain a healthy weight when taken on a long-time regular basis, it can also help to reduce body fat at the same time. According to a 12-week study published in the American Journal of Clinical Nutrition, green tea extracts may also have the power to help decrease obesity and obesity-related illness, like diabetes to quote for example. Green tea has been linked to lower levels of LDL which is known as the "bad" cholesterol, according to a paper published in the American Journal of Clinical Nutrition. In short, tea drinkers have slightly lower levels of LDL compare to those who do not drink green tea at all. So, load up on all that green tea. Those of you who drink green tea on a regular basis would have realized that their gum-tissue and gum bleeding problems doesn't happen that much, as compared to the rest of us who probably don't even touch a single drop of tea at all. According to researchers at a Japanese university, the more tea their test subjects drank, the fewer symptoms of periodontal disease are displayed, so drinking more than a cup of green tea a day is definitely the way to improving your oral health. Psst! It's not just about the specific brand and type of toothbrush and mouth rinse anymore huh? According to Harvard Medical School, drinking green tea daily can help you to lower the risk of heart disease. Reguar tea drinkers also showed a 26% lower risk of dying from a stroke or heart attack in a Japanese study of over 40,000 participants. And to further back this up, all these 40,000 participants consumed at the very least, 5 cups of green tea on a daily basis. So, do drink up on your green tea. Those of us (me especially) who are trying to cut down on caffeine can also reap the energy benefits of green tea as well. One 8-ounce cup of green tea contains at least 24 to 45 miligrams of caffeine, as compared to 95 to 200 milligrams in a cup of coffee, tea itself offers a boost of much-needed energy with the chance of a lower risk of headaches, shakiness and nausea that comes complimentary with caffeine overload. And that healthy jolt of caffeine in tea can boost exercise endurance, according to a research published in the American Journal of Physiology. So it doesn't matter whether you're an athlete or just a normal person looking for a quick and healthy instant pick-me-up, it definitely helps to go the path of green tea. 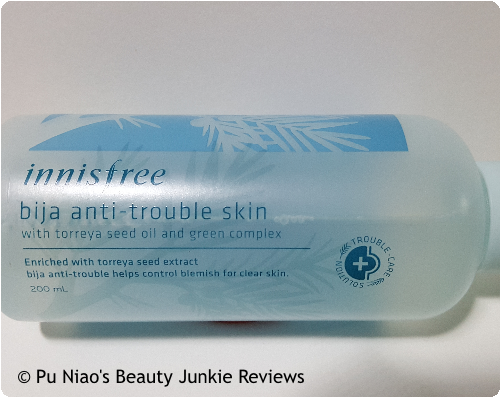 Innisfree Bija Anti-trouble Skin with Torreya Seed Oil and Green Complex: Natural originated salicylic acid, natural originated alcohol presents you with a clear complexion as it exfoliates dead skin cells that cause skin trouble and removes impurities left inside pores. A toner made from natural Jeju torreya for treating blemished skin! 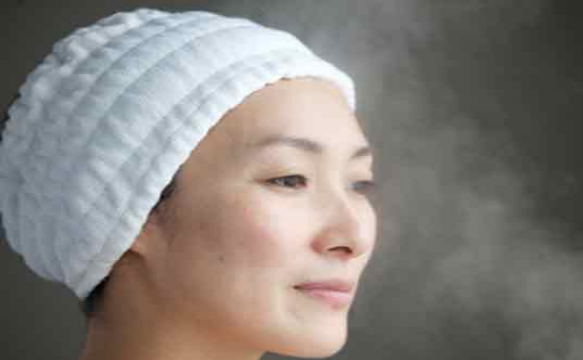 The outstanding healing effects of the torreya seed oil help troubled skin. 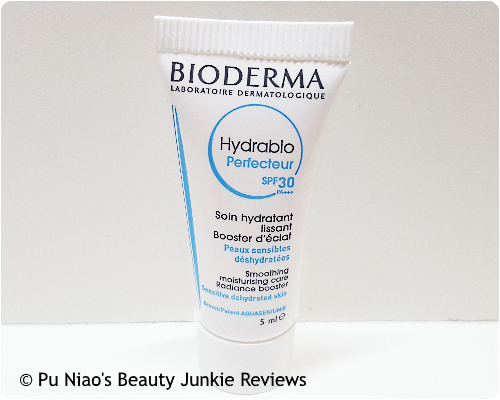 Contains natural salicylic acid for exfoliation and blemish care. The naturally fermented alcohol soothes skin. 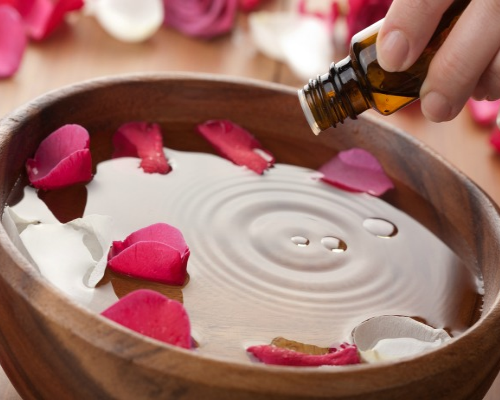 100% Natural essential oil: The scent of pine, juniper berries, and the forest comforts your mind and body. 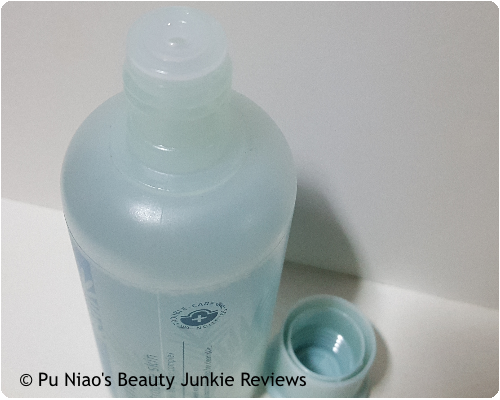 Despite the bottle looking all blue on the outside, this toner is actually a clear liquid instead of the blue we expect it to be. VERDICT: Scent-wise, there's a strong scent of alcohol with a hint of herbal tonic in it although the herbal tonic scent is more towards lemon grass scent. For those of us who are sensitive to the scent of alcohol or whose skin is sensitive and allergic to alcohol, this product might actually do more harm than good. 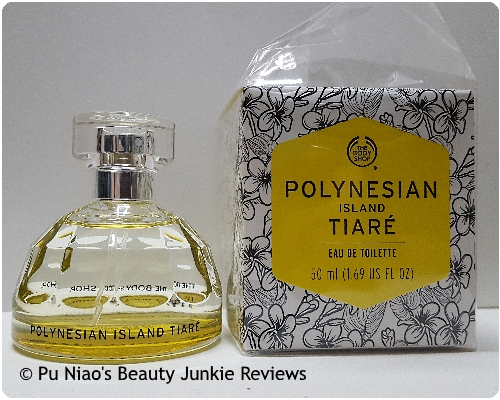 Although funnily enough, part of the product describes this product having the scent of pine, Juniper berries and woods and most reviews for this product I have come across have a varying difference when it comes to the scent. And at the same time, it's a toner made from natural Jeju torreya, which means it should smell more like torreya instead. But personally, I don't find the scent too "dramatic" in terms of the difference in scent. 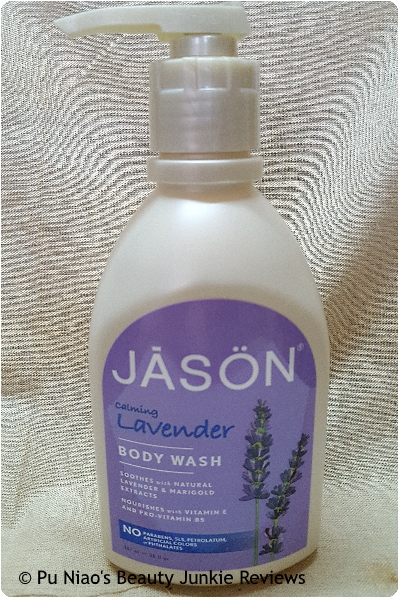 Upon using this toner, it gives a refreshing and clean feel to my skin after using it. And to be honest, a toner is essentially a liquid that delivers beneficial ingredients directly onto the skin after cleansing. And depending on the formulation of the toner, it can also "close" or minimize pores and smooth the texture of the skin, ready for the application of moisturizer and/or makeup. Although toners containing alcohol can be somewhat controversial towards certain toner users as alcohol can be drying. But at the same time, the drying part can actually clear the skin of any excess sebum on the spot to ensure sebum doesn't mess with the moisturizer that follows soon after. 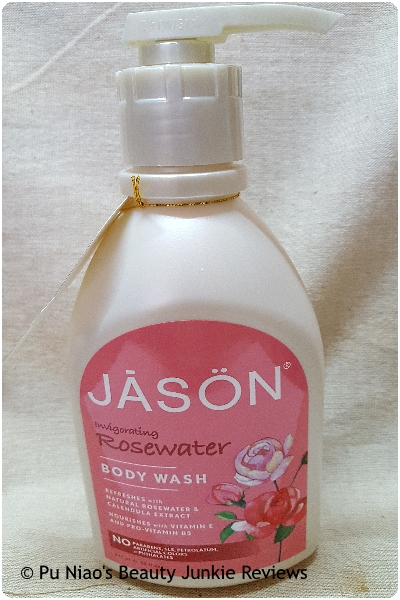 For me, this toner helps to control oil and sebum on my skin without making my skin feel too dry after using and luckily for me, the toner doesn't irritate my skin too much especially when pimples are present. And upon using, I can feel and see my skin brighten up a little although I doubt it helps in the whitening department though. I mean, I haven't heard of any toner that whitens complexion. Complexion whitening tend to be products in the serum or moisturizer range, as far as I am aware. And personally on my skin, it actually feels a tad hydrating instead of the usual dryness I encountered when using other brand toners. 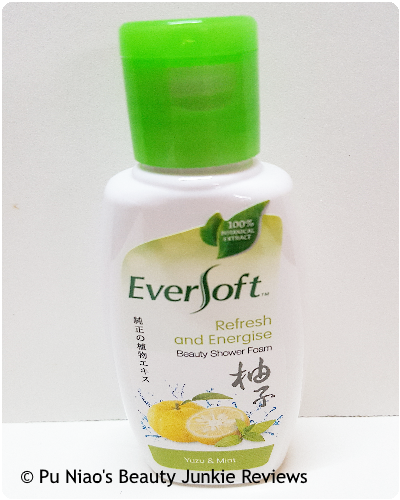 Sometimes, when my skin feels too oily and shine-reflective, I just use this to clear off the excess sebum on my skin. But I don't recommend continuously using the toner throughout the entire day repeatedly just for the sake of getting sebum off your face though. I tend to use it only when my face and skin actually feels "heavy" from the serum and I want a quick refresh on my face to feel better. It does help dry out the whiteheads, on a side note. As I've noticed less whiteheads showing up on my skin after using this product for the past 1.5 years. WHAT I THINK: Although this toner contains alcohol, I personally find that it doesn't over-dry my skin at all. In fact, my whiteheads are noticeably lesser after using this toner. 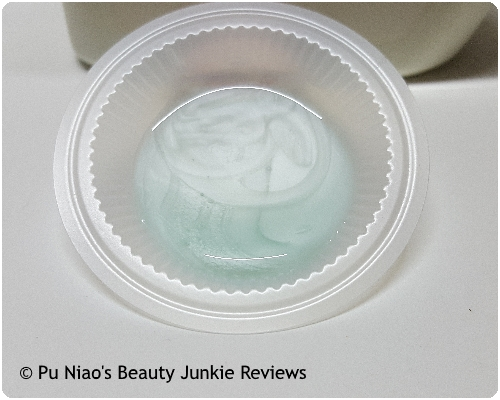 It hydrates and also reduces the amount of sebum on my skin as my skin condition is of the combination type. Whitening wise, I don't really see much difference but it actually brightens up my skin a little after using. 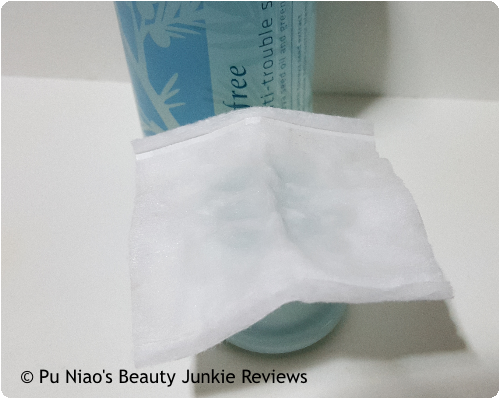 WHERE TO REDEEM SAMPLE: You can pop by any Innisfree outlet and enquire for sample sachets to bring home and try it out before committing to this product on a permanent basis. Or alternatively, there should be opened sample bottles in their outlets. 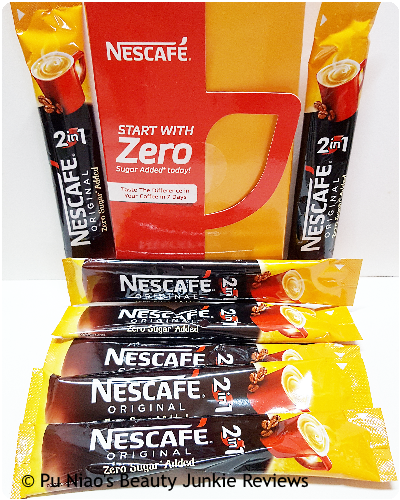 But I still recommend asking for sample sachets that you can bring home and try instead.